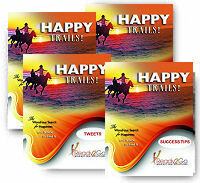 Starter Package: Happy Trails - The Wondrous Search for Happiness and Where to Find It from Ready2Go Marketing Solutions, Inc. The Starter Packs are designed to help you grow your list and nurture relationships with the new and current members on your list by providing valuable content that keeps you in touch. Consistency in communication is critical when you are building your business. And what better way to communicate than to give your current and future clients free content on topics they care about. This is more than 40 pages of done4you content that you can customize as your own, to help springboard you in your business to grow your list and nuture relationships on a regular basis. Do you ever find yourself putting things off? Even things you like to do? Sure, it’s understandable that we procrastinate on the tasks that are stressful, time consuming or unpleasant. But what about the things we like to do? Procrastination involves an inner conflict between something we want or need to accomplish, and the resistance that exists in us to actually doing it. It seems like we’re prepared to act, but then end up doing nothing about it. So what gives? Even though procrastination inevitably shows up in each of our lives, we can’t take its presence lightly. Procrastination may be one of the biggest challenges each of us will have to overcome at various times in our lives. And in today’s fast-paced world, it’s even more important that we manage our time efficiently and limit procrastination as much as possible. Procrastination doesn’t have to define us. With simple, daily commitment to progress & action, we can live the life of our dreams, and accomplish all our goals. This topic will help your clients continue on their path of productivity, learn to make choices quickly, powerfully and easily. They will find they are taking action more easily and no longer avoiding tasks and situations that feel overwhelming. By making a few simple changes presented in this program, their worlds will literally brighten with new energy and enthusiasm.